Four weeks ago, Charnze Nicoll-Klokstad was back home in New Zealand. Photo: George Tsotsos. New team, new country, new chance to stake his claim as an NRL footballer. It has been a whirlwind month for Charnze Nicoll-Klokstad who only four weeks ago was back home in New Zealand wondering if he could force his way back into the Warriors side. The 23-year-old made his NRL debut on the wing against the Sydney Roosters at Mount Smart Stadium in round nine in 2017 and went on to make another six appearances for the club that season, running in seven tries. Nicoll-Klokstad, the Warriors’ Intrust Super Premiership player of the year in 2016, didn’t get a game the following year and his career was at a crossroads. Then he got a call from Ricky Stuart, offering a fresh chance at the Canberra Raiders. “I saw it as an opportunity for a fresh start. I was struggling to get game time and I had been there for three years so I felt like I needed to move,” he told Region Media. Nicoll-Klokstad sat down with his partner Sarah, his two-year-old son Rio and eight-month-old Kyrie to outline the pros and cons of moving away from home and chasing his NRL dream. One of the big pros on the list was the opportunity to play at fullback, having played all seven of his NRL games either on a wing or at centre. “There was a bit of a risk coming here and so late, having to adjust to different things, spending time away from my family, there was a load of cons that we had to weigh up,” he shared. 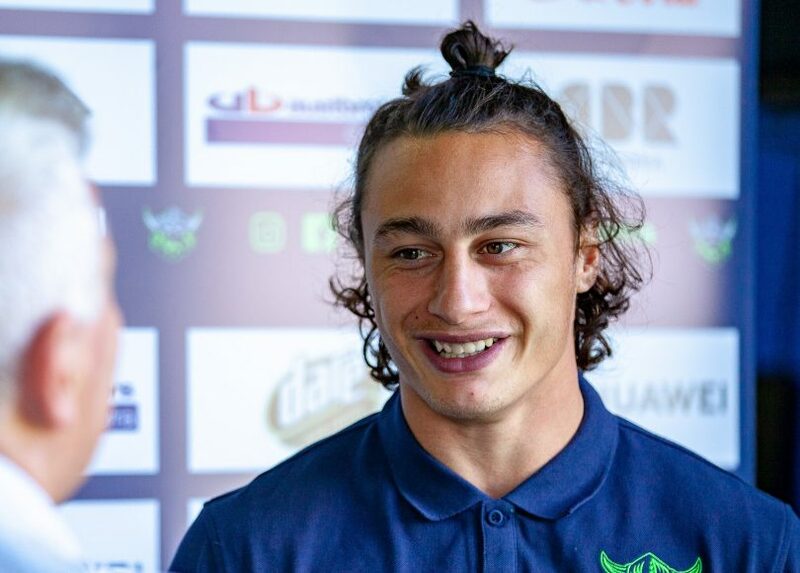 “Jack [Wighton] moving to five-eighth opened up a position that I really wanted to play and Canberra was willing to give me a two-year contract so there is more security for me and my family. Not that it has made the move easier, having to spend five weeks without seeing his young family. “My youngest is learning to crawl and my older boy is starting to talk a little bit more so there are some things that I am missing but I had to look at the bigger picture and see that the sacrifices that I am making now will be beneficial for my family when they move over here,” he shared. He took the gamble and moved across the Tasman. There were no guarantees – all he could do was empty the tank and hope it would be enough. A week later he ran out in the lime green of the Canberra Raiders with an impressive performance against the Paramatta Eels, staking his claim for a starting spot come round one. This Sunday night he will make his professional debut for his new club against the Gold Coast Titans, proving that all the risk was worth it. Raiders squad: 1. Charnze Nicoll-Klokstad, 2. Nick Cotric, 3. Jarrod Croker (C), 4. Joey Leilua, 5. Bailey Simonsson, 6. Jack Wighton, 7. Aidan Sezer, 8. Josh Papalii, 9. Josh Hodgson (C), 10. Sia Soliola, 11. Joe Tapine, 12. Elliott Whitehead, 13. John Bateman. Interchange: 14. Siliva Havili, 15. Ryan Sutton, 16. Dunamis Lui, 17. Corey Horsburgh. 18. Sam Williams, 19. Jack Murchie, 20. Luke Bateman, 21. JJ Collins.